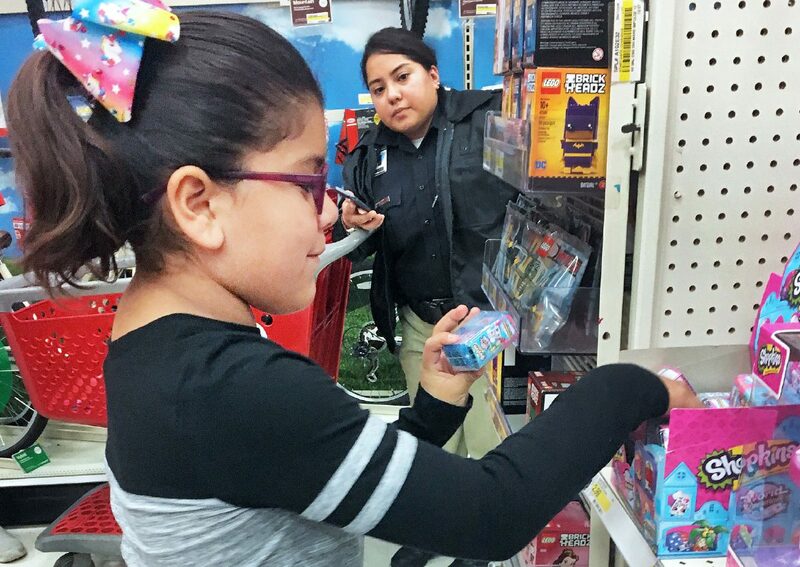 Destiny Orocio, 9, from Rayburn Elementary School, shops Tuesday during the Heroes and Helpers event Tuesday at Target in McAllen. McALLEN — Two-hundred children from local schools were given the shopping opportunity of a lifetime Tuesday. Students from 20 McAllen ISD elementary schools were gifted store cards with $100 to spend on their heart’s desires. Jose Bravo, 7, from Sanchez Elementary School, shops Tuesday with the help of Ernesto Chavez from the McAllen Fire Department. 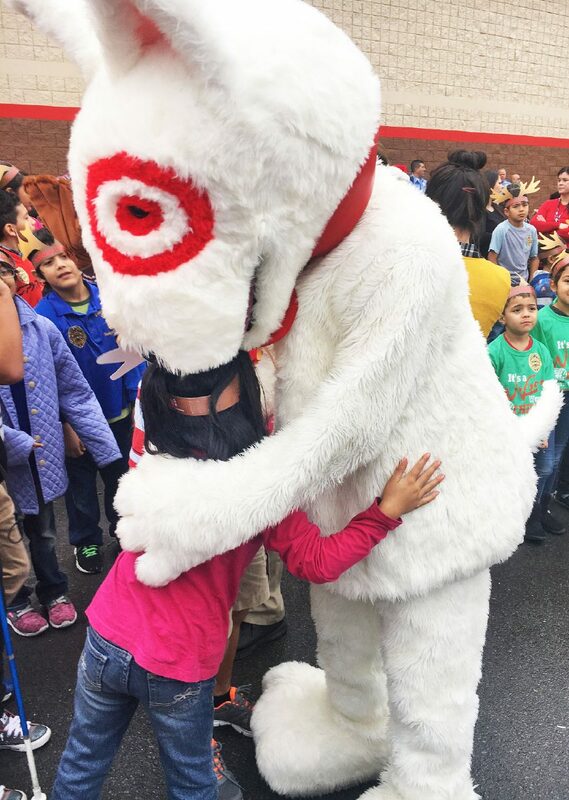 The Target mascot Bullseye greets McAllen schoolchildren participating in the Heroes and Helpers event Tuesday in McAllen. Santa Claus also made a guest appearance, pulling up in a police car to a swarm of children shouting his name. Bullseye, Target’s famous bull terrier and official mascot, was also present to take photos with children. Victor Rodriguez, police chief of McAllen, was present with the department’s community affairs staff, along with the fire department and volunteers for the four-hour commitment. “All of us come together to try to lighten up the holiday season for the kids,” he said, adding that another community outreach event is in the works for Saturday to be held at the McAllen Municipal Park. As children entered the store, a fire truck hoisted a supersize U.S. flag. The officers, fire officials and school staff (teachers and principals) accompanied the children to help them navigate the store and stay within their budget. 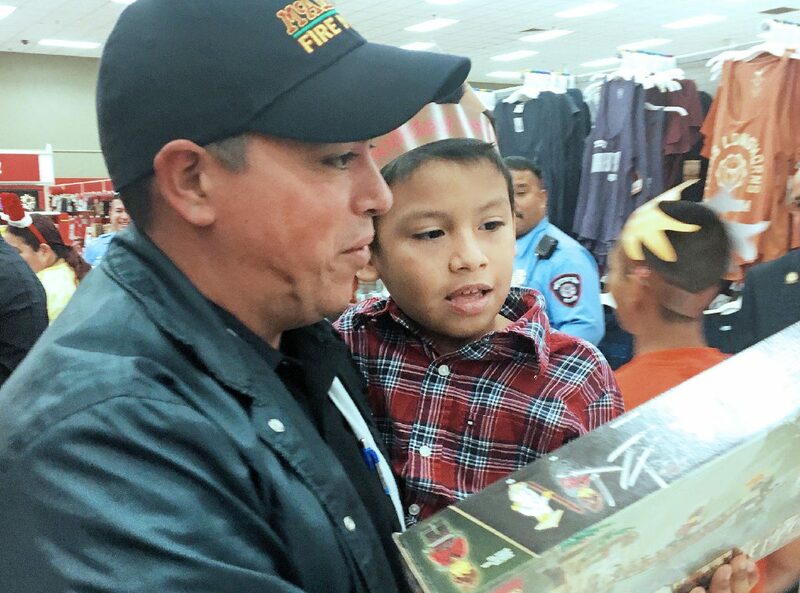 Seven-year-old Jose Bravo from Sanchez Elementary shopped with Ernesto Chavez from the McAllen Fire Department. The first items in his basket were sports balls, one for him and one for his older brother. From the athletic department he made his way over to the toy section, the most student-packed area of the store. Christian Cruz, an 11-year-old boy from Milam Elementary was found in the clothing department with his mom. Cruz intended to use the money to buy school clothes, but was allowed one toy. “I really want a drone,” he shared hopefully. Upon the approval of the grant to provide funds for McAllen students, McAllen ISD joined with the police department to help identify the kids that are most in need. “It’s just to spread some Christmas cheer with our kids in our community,” said Louie Rodriguez.